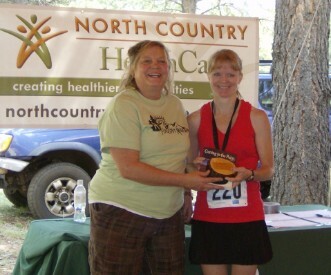 Serene captured 1st Place at the 2011 Flagstaff Marathon! Favorite marathon-they have all been memorable, but I really like the ones where my husband is on the course or at the finish line waiting for me. Buyer/Planner, but still looking for ideal job that suits me. Carbs – bread, pancakes, macaroni and cheese from a box, and Applebee's chicken sandwich, onion rings, and beer battered pretzel sticks the night before a race. Running, of course! And biking, hiking, kayaking, reading, puzzles, and crocheting. Primarily my i-pod, and sometimes my husband (he rides his bike while I run). I really don’t have a favorite book – there are too many good ones out there. 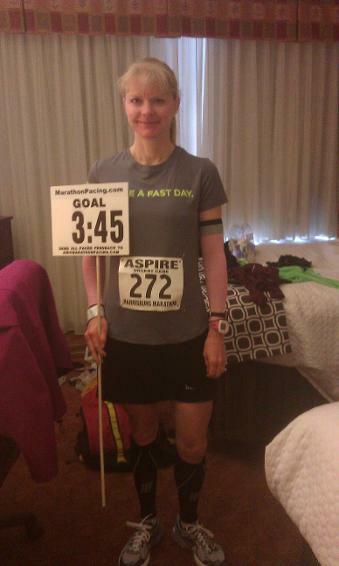 Run a sub 4:00 marathon in every state, take trips with my husband to create more memories. I always feel as if I have accomplished something every day when I run. I feel more energized and alive after running, and it also allows me to “pig out” every now and then and not gain weight! I also do some of my best thinking and decision-making when I run. My very first marathon – Honolulu, HI 2000. I was living there at the time and decided 4 weeks before the race to do it since I was there. I didn’t really train for it – my longest run before the marathon was 8 miles! This is not a smart thing to do, so don’t do it! I didn’t have a goal in mind for the race – I just wanted to finish. I was shocked when I crossed the line at 3:43. 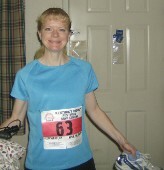 Pacing enhances my overall marathon experience. I love cheering a group on towards their marathon goals by being enthusiastic, energetic, and somewhat goofy during the race. There is personal gratification in helping others through pacing that cannot be matched – not only do I get to do what I love while pacing, but I also get to encourage and motivate others. Pacing is a challenge – instead of running for my best time or a certain place, I am accountable for those who have joined my pace group. They are counting on me! Fargo, ND - the runners in my pace group were spirited and seemed to enjoy my craziness. Some of them even volunteered to carry my pace sign, and I was able to get the crowds involved to cheer on my “awesome” group. And to top it off, all the other pacers were really fun to be with before, during, and after the marathon. I am high energy and enthusiastic. I will do what I can to keep your mind on your goals and having fun instead of any pain and doubts you may be experiencing during the race. Be prepared for silly cadences and cheers at every mile. Make sure you hydrate really well several days before the race – and go to the bathroom A LOT before you arrive at the start line! I don’t plan to stop at any port-a-potties along the way! Share your passion of running with others – spouse, friend, sibling, parent, child – or join a running club. I have not joined a running club, but sharing my passion with my husband enhances my running experience and makes it more enjoyable – he is my #1 supporter and cheerleader. I am grateful to have him in my life. Adopt A Highway litter clean up.